When August arrives, fans can almost smell it: football! Long before the air gets crisp and the leaves start to fall, the faithful endure sweltering heat to cheer on their favorite players at training camp. But attendees only see a fraction of a team's summer routine. What does a day in camp really entail? 8:15 a.m.—Staff meeting to lay out the day. 9:15–10:45 a.m.—Offensive and defensive meetings. 11:15–12:00 p.m.—Walk-through practice on the field. The guys take a break. 3:00–5:00 p.m.—Practice on the field with light contact (open to the public). 7:45–9:00 p.m.—Watch the practice tape and meet again. With the NFL allowing organized team activities (OTAs) and team minicamps prior to official training camp, the camp can be a mix of mental and physical exercises. There are also ever-changing rules about how long teams can have their players on the field during training camp. Ironically, the Rams use much of that time adjusting to new on-field regulations. “As far as some of the new rule changes, they’ve really talked about emphasizing proper tackling and those fundamentals. And those are things we definitely try to coach to our players specifically on defense," McVay said. Teams also switch up the format of their camps for various reasons. Practices that are closed to the public might be used to test trick plays. Or two teams will hold a joint session. After going against teammates for so many days, it makes sense to play a different opponent. 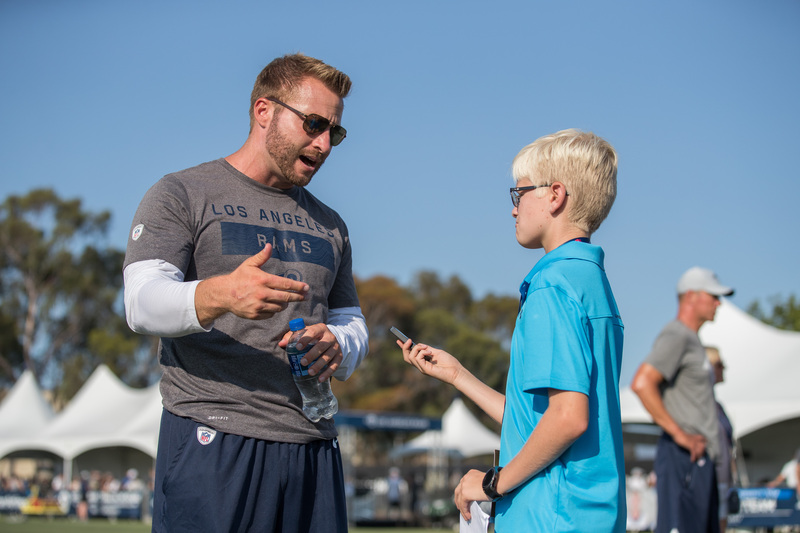 Despite all the downtime, training camp is still a fan favorite, as the Rams faithful endure triple-digit temperatures in the hopes of an autograph. Training camp seems to be as much about building a fan base as it is about building team camaraderie!